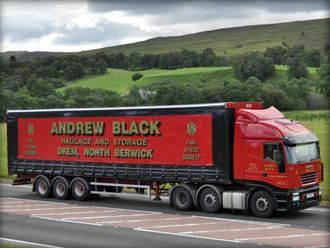 Established in 1958, Andrew Black Haulage and Storage is a family run business operating 25 units and over 50 trailers. 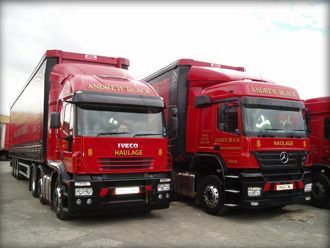 Andrew Black is recognised as one of the industry leaders in road haulage, utilising a distinct range of trailer types such as curtainsiders, tippers and flatbeds which allows the delivery of an extensive variety of services. The constant striving to improve efficiency and customer satisfaction resulted in Andrew Black being named Scottish Haulier of the year 2013 at the Transport News awards. To get in touch with your queries or road haulage requirements, please give us a ring, for free, using the click to call button. Alternatively, you can send your details via our email form on our Contact Us page.